Insulation provides a home with a barrier against environmental conditions, moderating temperatures inside to provide comfort while also saving on energy costs. For insulation to do its job properly, it is important to know where it should be installed. If you are planning on insulating an attic then you must consider using loose-fill or batt insulation. Loose-fill insulation is less expensive than batt insulation and will offer better coverage when it is installed properly. Prior to the insulation process, remember to seal any air leaks and complete necessary repairs. Do not forget to insulate knee walls. When remodeling, make sure to leave space between decks and be sure that the new addition is raised above the ceiling joists to leave room for insulation. Ducts should be sealed and insulated to reduce energy losses. Always try to install ducts in conditioned spaces in archways that they have proper insulation. When the ceiling is a cathedral-type, then you must provide a space between the roof decks and the ceiling in order to have room for insulation and ventilation. Foil-faced batt insulation is recommended in cathedral ceilings because it offers the permeability rating required for use in ceilings without attics. A vent baffle should be installed between the insulation and the roof decking to maintain the ventilation channel. The most proper insulation level to use on ceilings are R-30 batts that are as thick as R-25 batts, but fit into a 2x10 framing. When the spec is available, you can also add rigid foam insulation which increases R-values and eliminates thermal bridging, although this type of insulation must be covered with a fire rated material when they are used on the interior of a building. R-value refers to the thermal resistance that different insulating materials have. The higher the R-value of a material, the better it insulates from heat and cold. The R-value of insulation depends on the type of material, its thickness, and its density. 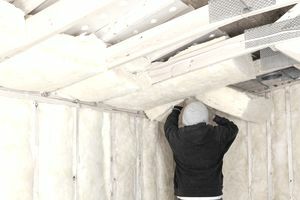 When remodeling, one of the best and fastest ways to insulate is using blown-in insulation. Blown-in insulation, when installed with the dense pack technique, will offer superior air sealing. It can be installed easily, reducing the amount of preparation needed. If you’re remodeling and your wall cavities will be open, look into two-part spray foam or wet spray cellulose insulation. If you are building a new home, then there are many alternatives to choose from, including structural insulated panels, insulating concrete forms, and insulated concrete blocks. All of these materials are considered insulating materials as they are manufactured with the purpose of increasing R values on a building. A nicely insulated foundation will minimize insects, moisture, and radon infiltration problems. Like walls, foundation insulation can be addressed if you decide to use insulating concrete forms and insulated concrete blocks. Normally when building a new home you might want to insulate the foundation before backfilling. The type of insulation in a basement will depend on whether the basement has been previously insulated or not. In new buildings, insulation will reduce thermal bridging, reduce heat loss, provide protection against moisture and reduce the condensation problems associated with poorly insulated areas. If you need to install interior insulation, you can use almost any insulation type and save money. Remember to check with your building code for types of insulation allowed on interior basement walls. Slabs on grade can be insulated by digging around the perimeter and installing foam board. When the building is new construction, then it might be easier to only install the foam board against the exterior of the slab and footing, or under the slab. Slab foundations with interior insulation provide more termite resistance, but some builders in the southeastern United States have even reported termite infestations through foam insulation on contained slabs.